For the past month, I’d been doing exactly what the horoscope writer was recommending today: walking, lifting weights, working on balance and more. Then I got stupid. I was returning from a walk when a neighbor who is moving invited me in to look at a few items she hadn’t yet found a home for. I came away with a pot and a collage, which motivated me to redecorate the entrance to my house. I moved the entry rug upstairs to swap it out for another rug. Coming down the stairs and holding the new rug in front of me I got to the bottom step and decided I had reached the ground floor. I was only one step off, but sticking out my foot and unexpectedly landing six inches below where I intended to land caused quite a jolt. In terms of damage, it could have been much worse. I chipped two small bones in my foot and twisted my ankle. The cure so far is to keep weight off the foot, no walking or driving for four to six weeks. The other part of the cure is to navigate on crutches. What sick person invented crutches? An internet search lead me to “5 reasons why crutches are the worst.” Only one of the writer’s five reasons is worth mentioning, namely, stairs. I have no idea how to use crutches to get up stairs. Arriving home from the hospital I stared and stared at my stairs (yes, that’s one problem with English spelling) and then sat down and pulled myself up each step, bottom first. In another on-line diatribe on crutches, stairs made the top of the list. The only other issue I could relate to was, “Giving up on physical hobbies…hello daytime TV and your couch.” My couch has been extraordinarily active the past few days while I have not. I don’t watch daytime TV, but I’ll soon empty at least one row of books on my bookshelf. By the end of four weeks at my current reading speed I’ll not remember a single title I read, but my bookcase will look a lot tidier. The big issue that none of these writers is willing to bring out in the open is that crutches cause weight gain. After not moving for say, an hour or two, and with no appointments, dates with friends and exercise classes on my calendar, I require a snack. The first one of the day — midmorning — is the healthy one: fruit, nonfat yogurt, raw carrots. It’s the only healthy one. Later in the day the edible item closest to the couch is fair game, tortilla chips, chocolate, graham crackers. Already my waistbands are tighter. On the other hand, the leg that lives in the boot that gets no exercise will soon resemble Hansel and Gretel’s fingers, though that wasn’t the body part I was most interested in slimming down. After a day on crutches, I was lucky to borrow a scooter from a friend. It solves some problems, but won’t help with the weight. I’m fortunate to have a husband who has taken over every household responsibility including cooking, and brings me whatever I ask for. Here’s hoping he doesn’t need crutches in the next few weeks, though if neither of us cooked, the waistlines should diminish. A return to blogging won’t help the weight either, but while I’m daydreaming on the couch, new topics might come to mind, thus forcing me to move to the computer, which is in a different direction from the refrigerator. This entry was posted in exercise, health, personal reflections and tagged ankle injury, crutches, medical boot. Bookmark the permalink. Been there, done that! Carrying down a laundry basket our stairs, broke my right leg after open heart surgery and I had gone back to work at ESC. Took the next couple months off and went to Arizona to recoup and came back after Christmas. We solved the stairs problem by selling our huge split level house in Sammamish last September and moving to a one story house (smaller) in Lacey. We’ve been thinking one story, but there are none around here. I’m so sad to learn this dreadful news! Please let me know when I can come and visit and share stories of our Greek adventure with Jackie, Joel, Chuck and Marti! Heal quickly! I hope I can see you soon. 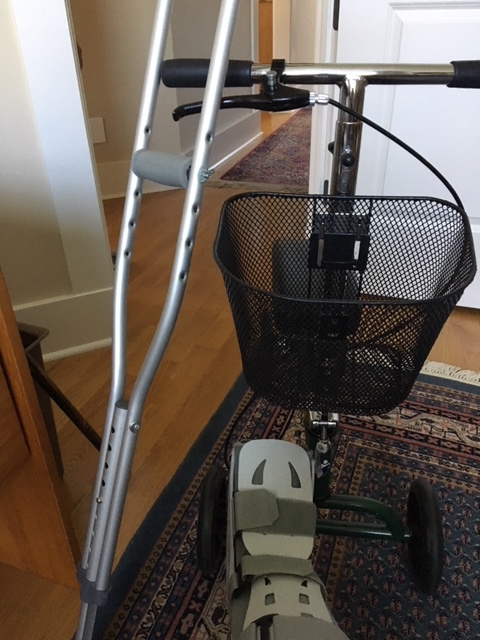 I can manage more or less with a cane and my big boot, though the doctor may have something to say about my walking this soon. But I can’t drive for a while. Since hearing your story another friend has had a mishap and broken a hip (requiring an airlift out of a remote wooded area) and another is getting over a broken foot. . .sigh. Aging – a step in the wrong direction perhaps? But still better than not aging!! What a terrible accident! Hope you heal quickly and can get back to your regular life. In the meantime, sit quietly and give in to the downtime. Thanks. I’m trying to figure out a blog on downtime. I’ve had so much downtime I’ve started to wonder about it’s value to my overall health. Thanks. It seems to be a very slow process. I guess that’s part of aging. Gosh Ann, So sorry! If must be especially difficult for someone as active as you are. Hang in and best wishes for a fast recovery–but don’t try to rush it too much. It’s a slow process — too slow — but I went out to lunch with my cabinet friends yesterday at a place where the driver could come right to the door.